Fox Backs CNN's Suit Over Jim Acosta's Credentials - Joe.My.God. Fox News has thrown its support behind CNN’s lawsuit against the Trump administration to win back White House correspondent Jim Acosta’s press credentials, in a stunning move for the cable news network whose on-air personalities have often criticized both CNN and Acosta. Fox News president Jay Wallace said in a statement that the company will file an amicus brief — also known as a friend-of-the-court brief — with the US District Court in support of CNN. Wallace also accused the Trump administration of weaponizing the press passes by depriving a CNN journalist of one. 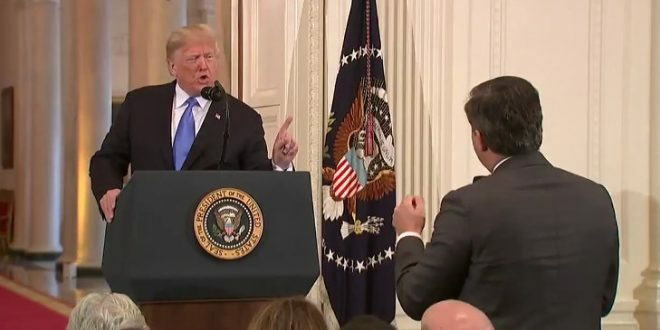 The Justice Department responded to CNN’s lawsuit over the revocation of Jim Acosta’s press pass on Wednesday, saying in a court filing that the White House rejects the idea that it can’t pick and choose which journalists can be given a permanent pass to cover it. “The President and White House possess the same broad discretion to regulate access to the White House for journalists (and other members of the public) that they possess to select which journalists receive interviews, or which journalists they acknowledge at press conferences,” lawyers say in the filing.